I’m just starting my annual Harry Potter “reread” – in quotation marks because I don’t think I’ve ever reached number 7, but normally get to at least number 5 – and I always do it around Christmastime because Harry Potter is just such a Christmas book for me. I’m back with another one of these posts because I’ve read 9 books since the last one! I’ll try and do one more before the end of the year too, because although there’s only 9 days of the year left, I’m still hoping to read a bunch! Hyperlinks in the titles are to reviews on my blog. Gone Girl by Gillian Flynn (4/5): I completely forgot how great this book was! Flynn’s writing style is honestly amazing, and I really want to read more of her novels. In Cold Blood by Truman Capote (4/5): another reread, this book has completely changed my life and I owe it a lot. Plus, it’s a great book too; Capote’s writing is something else. City of Glass by Paul Auster (3.5/5): this was a really bizarre novel but I actually really enjoyed it? I think I’ll read the rest of the trilogy – they’re only novellas anyway! Spellbook of the Lost and Found by Moira Fowley-Doyle (5/5): god this book was honestly incredible. It really made me think about things being, well, lost and found. I loved it. Paper Avalanche by Lisa Williamson (4.5/5): this was part of a blog avalanche I did, and it was such a fantastic book. I really related to Ro, the main character, and when it comes out next year I really suggest you read it! City of Ghosts by Victoria Schwab (4/5): this book was perhaps a little young for me, but still scary and exciting! I’m looking forward to book #2 coming out. Hot Milk by Deborah Levy (3/5): I found the writing of this book both a bit difficult and yet brilliant to deal with, but the story was something I struggled with more. Still, it was an enjoyable read. 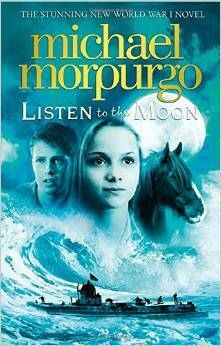 Listen to the Moon by Michael Morpurgo (5/5): I LOVED this book! It’s one of my absolute favourites of 2018, and I so recommend it! My review went up just yesterday, so check it out if you’d like! I’ve actually read a lot more in the past three weeks than I thought I had, and some really great books too! Have you read any of these? Do you want to? Today I thought I’d share just 7 of my most anticipated 2019 releases! I really want to get my mitts on all of these! I’ve tried to put them in date order for their releases. There are probably books I would be ridiculously excited for but don’t know about yet too, so I might do another one of these books in the future! Many book lovers I know cling on to books like a dragon clings on to gold coins. And dragons love gold coins. BooksAndLala on YouTube started off a Book Unhaul Challenge, but I thought I would continue on with the idea but asking a few more questions. I am going to try and get rid of a whole host of books this month, so these questions will be helpful to both me and (hopefully) you! I’ve wanted to participate in Book Roast’s Magical Readathon for the longest time, but I’ve always been too late to join! Not this time, however- finally, I can participate! I know this TBR is being posted on the day the readathon starts, but hey, what can I say apart from the fact I never really know what I’m doing until I’m doing it. Hey folks! I wrapped up university this weekend, and I thought that, instead of writing a long discussion post having just written thousands of words for uni, I would have a bit of fun and do a book tag instead! I found this tag over at Browsing for Books, where it’s an original tag by Ariel in association with Cerys, who runs the blog. Whilst I want to tackle my TBR (oh, and unhaul a whole bunch of books), I want to take this Christmas to both revisit and discover some awesome book series. I have about four weeks of Christmas holidays, but I will be working on uni work and of course Christmas is always a busy time of the year anyway, but here’s what I’d like to read!